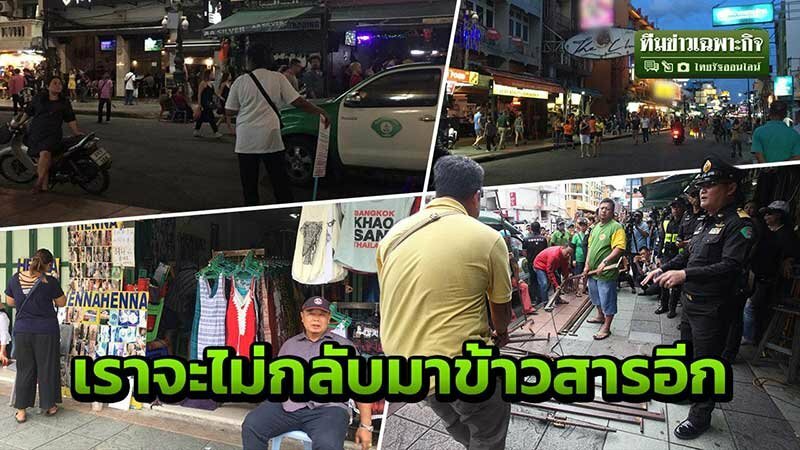 Thai media said that tourists have given a strong message to the Bangkok authorities and the government after attempts to sanitize Khao San Road. They have clearly spoken out saying: You are destroying the life and soul of the city – and we are not coming back! Thailand’s most influential and far reaching media Thai Rath went to the Khao San area to investigate after the authorities have tried to shift out the traders and stalls from the sidewalks. Despite opposition and refusals the area is already a shadow of its former self and tourists arriving are convinced they have come to the wrong place it is so quiet and lacking in life. Thai Rath said that traders in regular shops, tuk-tuk drivers and motorcycle taxi ranks in the area were all speaking with one voice saying that the tourists have virtually all gone. “No one believes it is Khao San anymore. They arrive then stand about looking confused. They ask “Have we come to the right place?”. They look left and they look right. I have pointed to the street sign to show them that despite their confusion they are indeed in the right place”. The message is clear: This is not the Khao San Road – not the vibrant Bangkok in the guidebooks and tourist promotion handouts. Traders spoke of a once busy and eclectic road and a thriving trade being obliterated in the name of progress and order. While Thai Rath said that it is a conflict between matters like the law vs the life of the capital and people’s livelihoods vs convenience. They said that the issue has divided opinion of people resident in the capital of Thailand. But they said the government’s efforts to change Bangkok into a place of order may be its death knell in the eyes of tourists wanting to see something they cannot experience in other cities around the world. The standoff between the the Bangkok authorities continued, reported Manager in a related story on Monday. But they said in the meantime from Aug 6th there would be a seven day calming period when traders would be allowed to set up one stall each on the sidewalks in the area from 6pm to midnight. But it is not known that this will be extended in a Thai compromise or whether the authorities will stick to their guns come next week and clear everyone out for good.